We all have our special people. Sometimes it’s a spouse or partner, or that friend that you can always count on, the one who always has your back and can pick you up when you are sure that you just can’t go on. It may even be a co-worker who makes every workday just a little brighter. 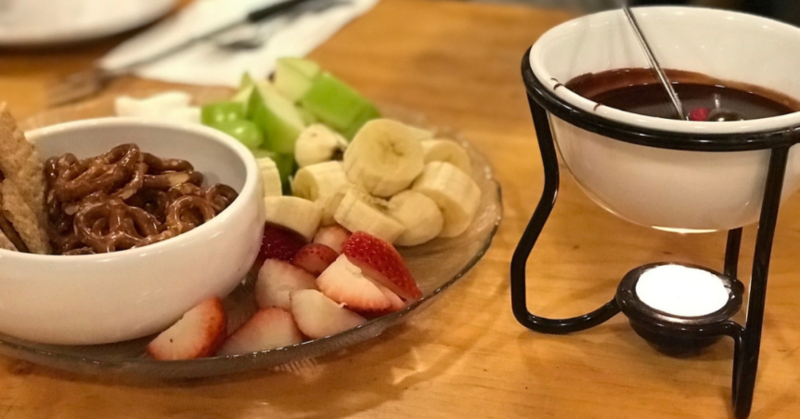 We were looking for a fun way to celebrate and be grateful for the love and support in our lives and to share it with others, so we decided to bring a group and their “someones” up to the cheese and chocolate fondue tour at Cypress Mountain. Stomping around in the snow is a great way to build up an appetite. The quiet of the woods gives you a chance to reflect on the love and kindness that surrounds you. Gratitude feels so good. Laughter is good for the soul. When your friend trips over their own feet, or toboggans down a hill on a plastic bag, you will both laugh so hard. Cheese fondue done right (and Cypress does it right!!!) is the nectar of the gods. Any meal that starts with exercise and ends in chocolate and fruit is a balanced meal in our books. We cannot say enough about the quality of the food served say the Hollyburn Nordic Hut. 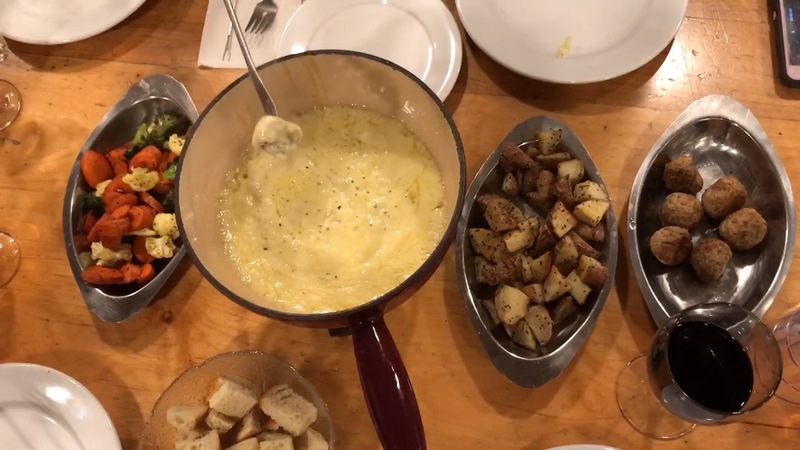 We started with a crisp beautiful salad, then into the cheese fondue portion of the meal served with potatoes, roasted veggies, meatballs, & fresh bread. And then there was the chocolate… gorgeous silky chocolate with fruit, pretzels, graham crackers, and marshmallows (of course we made smores!). Whether you are the friend that’s there for the cheese & chocolate, or the one who really loves chatting and walking in the woods.. everyone has a great time! 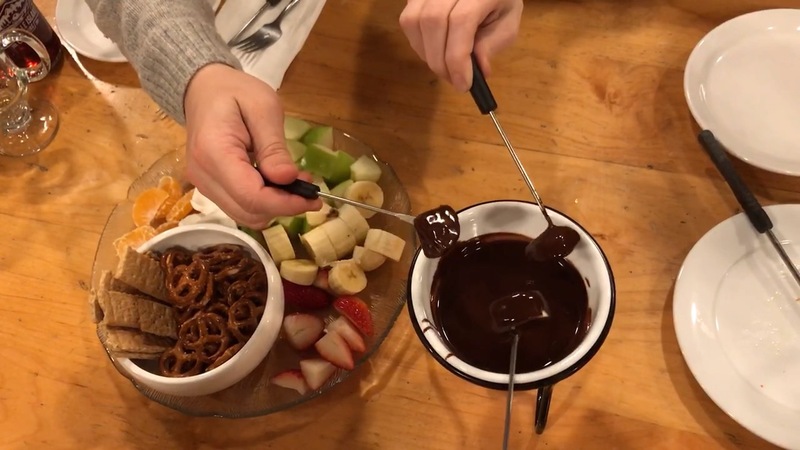 The Cheese & Chocolate Fondue tour at Cypress Mountain ticks off all the items on our list. Easy to book, fun, and involves chocolate. Win, win, win! Don’t worry if you have never been on snowshoes before. The guides will take great care of you and may even put the snowshoes on for you if you need it. 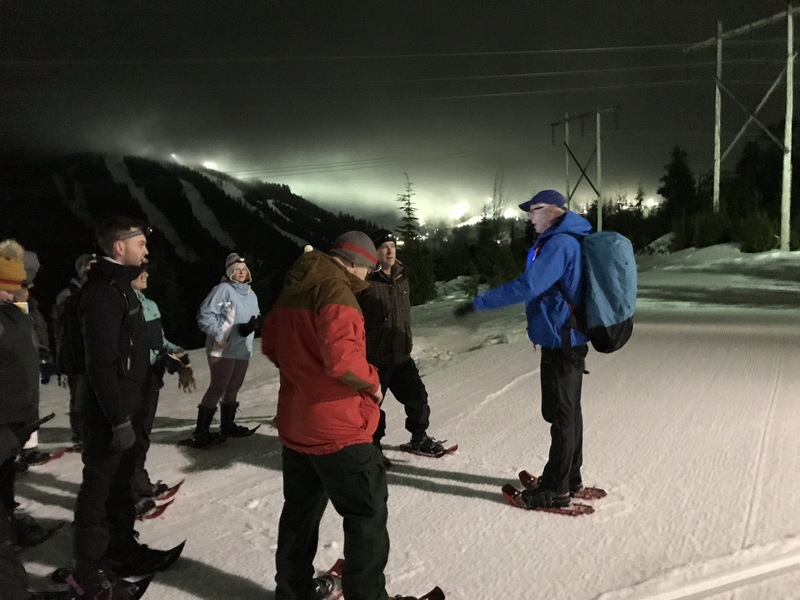 The snowshoe portion of the night is gorgeous as you wind through the hemlock trees of the sub-alpine forest and stop at natural points of interest. The guides are a wealth of knowledge. There is lots of snow this year and only a few remaining tour dates for the season. Once you arrive at the newly renovated Hollyburn lodge, you will be treated to a wonderful spread of delicious food. We opted for the cheese and chocolate fondue tour. Wine and beer are available for purchase if you would like (we certainly did). But you don’t have to take our word for it. Here is what the other members of our group had to say. 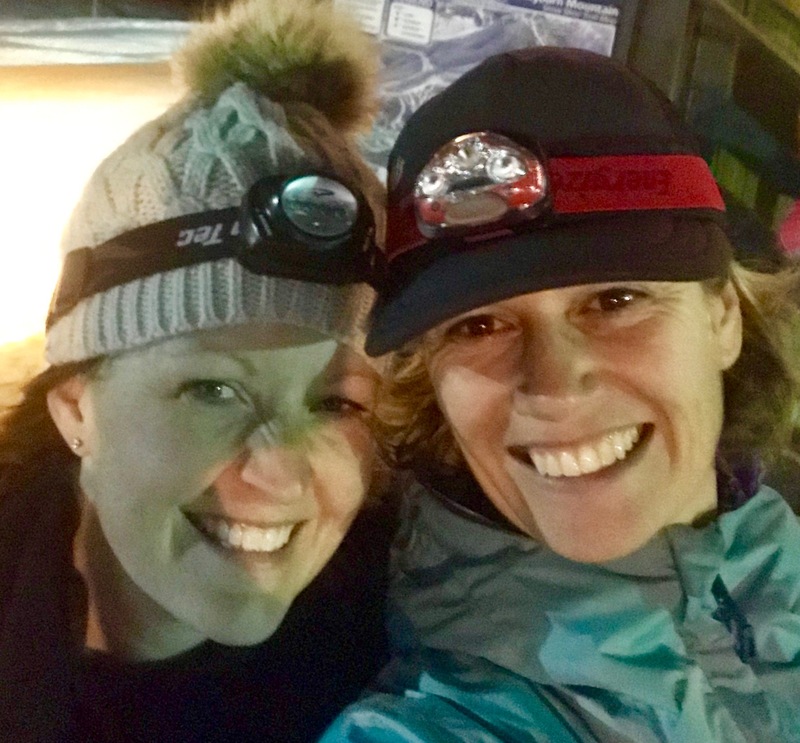 Our group was a mix of ultra runners, triathletes, cancer survivors, and mostly regular parents who hadn’t been active in years. We all had a fantastic time and will all be back. To book your tour, call Cypress Mountain at 604-926-5612 or visit their website and book your tour before they book up for the season. It is worth it. 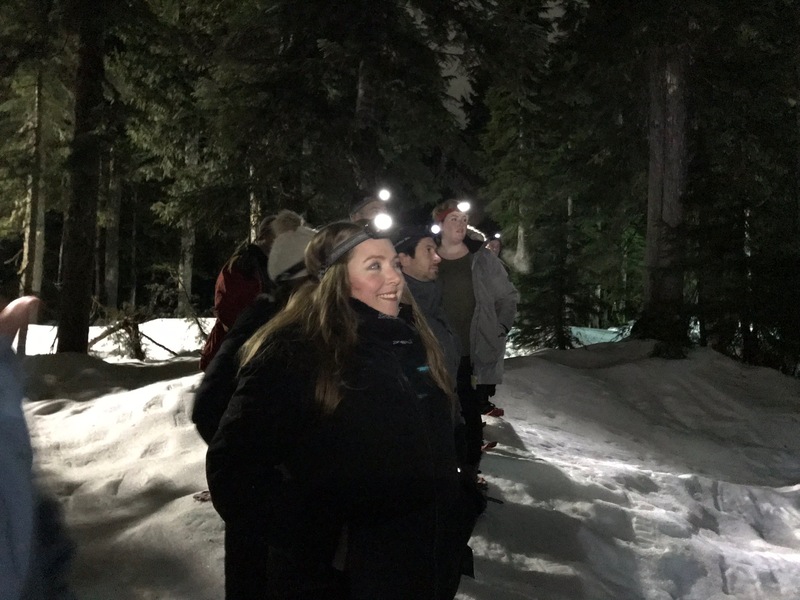 Click here to find out more about snowshoe tours (some are kid friendly) and all the other winter fun to be had at Cypress Mountain. We love it up here! Have you booked tubing at Cypress Mountain? Snowshoe Fondue Date Night at Cypress Mountain! Skooter Camp Magic at Cypress Mountain!